As I said yesterday, it’s been a tough decision about what to pick as BotW this week. 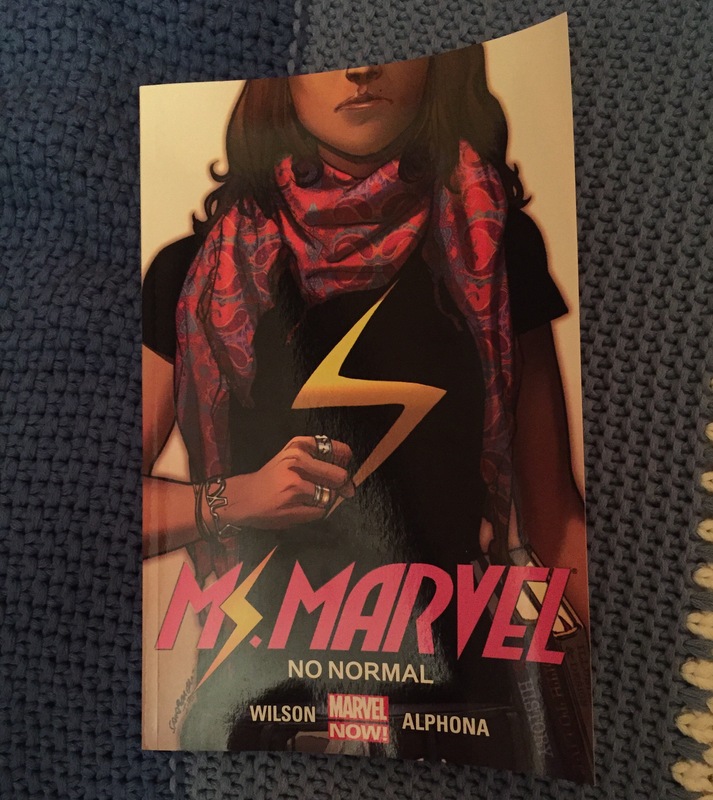 In the end I settled on Ms Marvel, because it was my favourite thing that I read last week, even though I don’t always have a lot to say about graphic novels/comics when I write reviews. But then as I’m thick with cold and cough (in July! I know! So ridiculous) perhaps its the lurgy blocking my creative juices. Lets stick with that. So, Ms Marvel. I am not up on the Marvel Universe – I’ve seen a few films (they didn’t have Ms Marvel or Captain Marvel in them), but then who hasn’t, but I think this may be my first actual Marvel Comic. I believe – although I may be wrong – that this is a reboot of an earlier character, but I haven’t read any of the earlier stuff so I don’t have the full back story. But then I don’t think it affected my enjoyment not knowing any of the rest of the history. So, the story. Kamala Khan is a Pakistani American teenager in Jersey City. She’s Muslim and her parents are very protective of her. She chafes at some of the restrictions placed upon her by her family – and ends up with superpowers after an incident at a party she sneaked out to. In the first trade – No Normal – she gets her powers and starts to get entangled with the Inventor (who we assume is a villain). I enjoyed this – Kamala is fun and multi-dimensional and she has real-life as well as superhero-y conflicts in her life. The supporting characters are also great and I learnt a few things as well but in a subtle way. It ends in a bit of a cliff-hanger and I’m fairly sure I’ll be buying Volume 2 when I next get to the comic book shop. I’m not putting any links to buy – because I want you to go down to your comic bookstore and do it there. Find your local comic book store here.